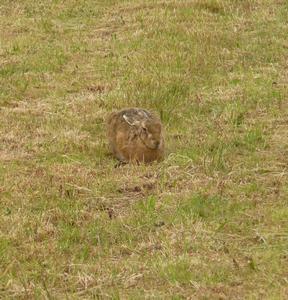 The Brown hare is seen much less than the introduced Rabbit but can still be found in NPT. The hare is sleeker than the rabbit with much longer ears and hind legs. The ears are always tipped black. Hares live in open fields with occasional shelter. They can be very difficult to spot, in the day they tend to hide in a small dip in the ground called a ‘form’. If you are lucky you may see hares boxing – this is usually a male and female. In NPT hares are found mostly in lowland farmland and the upland commons and open land. For more information see The Mammal Society Brown hare page.